Portuguese prog rock with some definite jazz tendencies.Interesting and worthwhile addition to any prog fans collection.Very much like "french prog jazz" ZAO meets Italian ARTI MESTIERI, with lots of Sax , Moog and electric violin. Highly professional musicianship and even an oriental (indian) feel to some songs , from which the band's name is a clear source. Very strong is also the late 70's Frank Zappa influence, along with a strong impro funky style reminding me some early Funkadelic works or the 70s Miles Davis explorations in funk music. Oddly, the book 'Scented Gardens of the Mind' says this band plays "lush, instrumental progressive rock", which is way off the mark. Maybe it's just true for their previous album? Don't know. Unfortunately I also found the description here to be pretty misleading. I like Zao, Zappa, Funkadelic and Miles Davis but it didn't remind of any of these - to my ears this is mostly so-so funk-fusion with a very mainstream feel. Also, some of the sound was a bit suss because the files seem to have been ripped at a volume that gave lots of clipping, and then reduced in amplification. Thanks for preventing me from spending money on this album, if the opportunity had ever arisen. 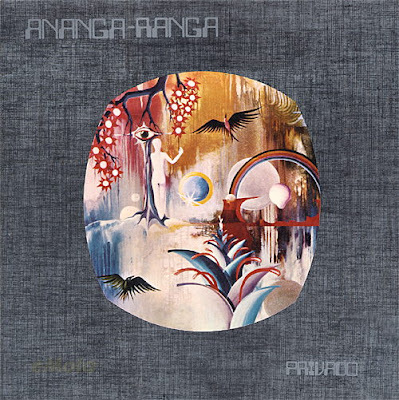 I'm looking for the Ananga's 1st album called "Regresso as Origens" from 1976. In MP3 192 bit or better. Do you have it?